As you know I am what is deemed to be an "Older Woman". Older than what I'm not quite sure, but those of you that know me know this really isn't an issue for me, as oddly enough my insides still feel the same as when I was 20! I remember years ago asking my Mum when I would feel like a grown up? Her answer was " Oh Lyn you never will" and it was true. Nowadays I look in the mirror and there is a grown up looking back at me, phew when did that happen? I think we have all gone through that mirror moment, where you suddenly realise that the texture of your skin isn't quite the same; your lids are not as taught as they once were, but you know what? I don't flipping care, I love this age, I love the fact that we no longer worry about nipping to the shop with no "face" on. Nowadays we have so so much choice! We can choose to be the best version of us possible, we can choose to feel gorgeous without the worry of what the world will think of us. I honestly think that now is the best time to be an "Older woman". Previous generations had the one compact and same shade of lipstick for years and now we are spoilt for choice, or are we? There is more makeup than you can shake a stick at on the market today. We could brush, blend, cut crease, contour etc etc. Or do we just look at this array and think hmmm maybe when I was younger! The thing is all of this gorgeousness is aimed at a different generation, not on purpose. I don't think the intention was to exclude us but our needs are different to when we were 20 something. I think any make up can be worn at any age but I am now doing a happy dance being able to give you the news that we now have our very own High Street range. 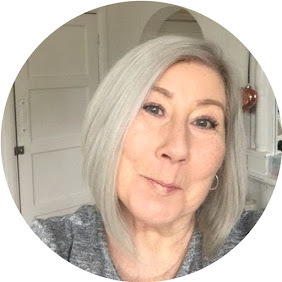 L'Oreal Paris are the first high street brand to take the need of older skin into account and have designed a range of makeup specifically for us. We have different needs and they have addressed these with the creation of L'Oreal Age Perfect Makeup. Available in 13 shades, this medium to full coverage foundation applies really easily. I have tried it with brush, beauty blender and fingers. I prefer a brush and found the application quick and easy. I featured a photo of me wearing this on Instagram while I was testing it out, only to be accused by "family" members of using a photo filter (how very rude) and I now regret not stating the #nofilter tag in case anyone else thought the same. This foundation gives you the soft glow finish that blurs fine lines and wrinkles, literally stays put all day way into the night. And quite frankly is like nothing I have experienced before for the price. Available in 4 shades, shown here are 110 Peach & 101 Rosewood. Both of these shades are gently flattering for any complexion. While being powder formula they are soft and blend beautifully. Complete with their own little brush the handy compact can be popped into your bag for a quick brighten up during the day. Although when I tested these out I didn't feel the need to top up through the day, I just did a quick pep up for the evening. The beauty of this blush is that it has no glitter and just gives a delicate flush to your cheeks. This mascara is available in Black & Brown. It will give you a great one coat, but if like me you prefer fuller lashes it builds beautifully and I found it perfect with 2 coats. Not only will it give you great looking lashes it contains Pro Keratin & Filloxane which will strengthen the lashes and prevent breakage. I personally think a good mascara is largely based on the brush, this wand has tightly packed soft bristles that coat each lash individually with a tapered end to ensure you get every last tiny lash available. This Dual end pencil is available in Taupe Grey & Ash Blond. Soft enough not to scratch yet hard enough to stay in place. These pencils really are suited to any complexion and will not give you the ‘look at me in your face’ brow that has become so fashionable nowadays, but allow you to gently frame the eyes with neat brows that look natural but groomed. The brush end is ideal for brushing before application and tidying up on completion. Available in 6 shades. One of the nightmares of getting older is having lipstick creep into your lip lines! You start the day looking great but catch a glance in a mirror and whoa, crazy paving! This lip liner cures that problem once and for all. The soft texture is comfortable to apply, in fact they are so nice you could actually use them as a lipstick or as a base for your lipstick. But as lip liner they work beautifully, giving your lips the fullness and definition that fades as we get grown up. Available in 12 shades and designed to suit all complexions, this is not just a lipstick! As you can see the centre of the lipstick is filled with moisturising balm that will condition your lips and give a smoother texture. Which is noticeable from the very first wear but will also continue to work over time plumping the look of the lips. I found these super moisturising but not at all greasy. They were comfortable to wear and didn't feel heavy or sticky, more like a lightweight balm but with exceptional colour hold. So, there we have it. Finally a High Street range that has taken us from invisible to fabulous. I personally don't think we are invisible, some of the most beautiful women I have ever met have that sparkle in their eyes that comes from knowledge and inner confidence. I love this new range not only for the products but for what it stands for US, YOU AND ME, my personal favourite is the foundation. This Post is Sponsored by L'Oreal, all views are my own, may contain AF links.